Last week we discussed the “phoenix” effect of when a new venue rises from the ashes of an old venue. Sometimes the fortune of the location changes for the better, sometimes the voodoo jinx never goes away. (think of Crazy House – ex teazers -ex freebird and ex many more). This week’s wander Dream Club Agogo is the phoenix of a hugely popular gogo called Carousel Agogo. The location is a few units into the soi Diamond arcade area almost across from the carousel spinning bar. When this large gogo was in it’s Carousel form it was very successful and had a rotating gogo stage complete with carnival horses, with tails that always fell off, which appeared to make the horses have large exposed assholes. The sniggering schoolboy humour in the crowd made for a fun atmosphere every night. Rotating shows and abundant stunners made it tick every box. Jump forward to October 2014 and we can see that the rotating stage has been replaced by a large square podium with 7 short skirted maidens doing the Isaan Shuffle. The chess board layout means that there will always be a few girls obscured no matter where you sit so it’s a bit of a silly layout. Seating wise we have double tiered bench style on 2 sides and a strange boudoir chaise loungue squeezed beside the entrance and a few smaller cove type seats for a more intimate location. It’s a strange setup and the phrase of “keep it simple” definetely didnt come into the plan when they were designing the joint. It simply makes the place feel uninviting. The dark interior also adds to the lost feeling. Maybe the management want the punters to get lost and never find their way out again. “Ok Flirtman we’re not here to look at the decor tell us about the women”… i hear you scream at the screen. Well as i mentioned, you have approx 7 up dancing. That’s the good news. The bad news is that there were only another 5 sitting down staring anxiously hoping to catch The Flirtman’s eyes. More good news tho……they all looked very nice indeed and no mingers hiding in the shadows. Being 1 of only 3 customers on this friday evening (11pm) every stage girl tried their best crouch, bend and gyration technique to hook this fish. One even had a strange 70′s afro disco wig. Go figure ! You’ll grab a small draft beer in here for 65baht or a bottle for 100 baht which isn’t too bad considering they do have shows at certain times throughout the evening (although i had just missed one by minutes…apparently). Do be aware with the lady drinks as they come in at 150baht and whilst this does seem to be getting the norm in our fair town, one can only think that the gogo bars are coining it in as the girl gets 50baht and the bar takes 100 on a drink that probably costs 5baht. The million baht question is whether i’d be running back to do a return visit is a difficult one. The place has zero atmosphere, zero uniqueness and zero fun on the evening i went in, but if you throw all that away and want a quiet, dark corner with a pretty girl and cheap beer whilst watching what is probably a decent show on stage then it might be enough to give it another try. 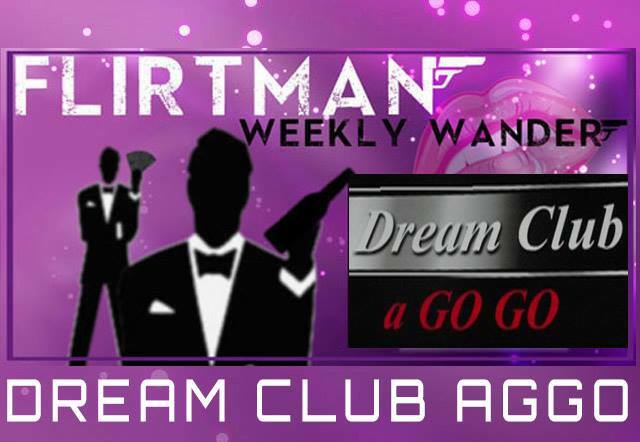 For the moment Dream Club Agogo gets a 5 out of 10…but the ladies are a 7 !